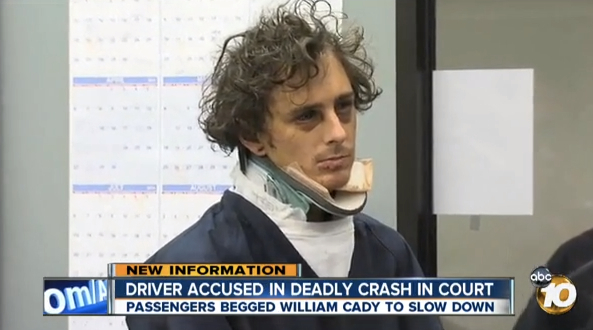 Murder charges were added Friday against a 25-year-old motorist who allegedly was drunk when he got behind the wheel of an SUV that crashed at a Clairemont-area freeway interchange, killing three of five passengers. William Daniel Cady was arraigned on the murder charges Friday and pleaded not guilty. He was charged in January with gross vehicular manslaughter while intoxicated and DUI causing injury. At Cady’s initial arraignment, Deputy District Attorney Makenzie Harvey said Cady and four companions were drinking at a friend’s house, then at a bar in Clairemont Mesa the night of Jan. 10. A bartender eventually told Cady and his friends that they were in no condition to drive and gave them resources to take a cab home. But the men bought more alcohol at a grocery store, then made their way to a second bar and were kicked out of that establishment for being too rowdy, the prosecutor said. Cady drove his 2000 Cadillac Escalade onto the northbound 805 and accelerated, prompting others in the SUV to ask him to slow down, Harvey said. Cady told his friends that it was his car and “he would drove as fast as he wants,” according to the prosecutor. Shortly after 11 p.m., Cady lost control of the SUV on the ramp to westbound state Route 52, causing it to veer off the road and overturn, according to the California Highway Patrol. Three other vehicles following the SUV then crashed, as well. Four of the men riding in the Escalade were hurled out as it rolled side- to-side several times, CHP public-affairs Officer Jake Sanchez said. Two of them — Taylor Bednarski, 29, and Shon Gilliam, 23, both of San Diego — died at the scene. A third passenger, 35-year-old Jeffery Becker of Kern County, died in the crumpled vehicle. He was the only person in the SUV wearing a seat belt at the time of the crash, according to the Highway Patrol. Medics took Cady and the surviving passengers to hospitals for treatment of serious trauma. Two other motorists involved in chain-reaction accidents were treated for minor injuries. A readiness conference was set for July 18 and a preliminary hearing for Aug. 13.